Here, everything you need to know about green garlic whether you already love it, want to try it for the first time or are a brave vampire who misses garlic and thinks that maybe the young stalks won’t prove lethal (good luck). Before garlic blossoms into the famously pungent bulb we know and love (which was the subject of this week’s Mad Genius Tips video), it spends its adolescence as a delicate, lightly perfumed stalk known as green garlic or spring garlic. Where: Since garlic is an easy crop to grow, green garlic can be found in most places. What to look for: Opt for bright green stalks that aren’t drooping or soggy. 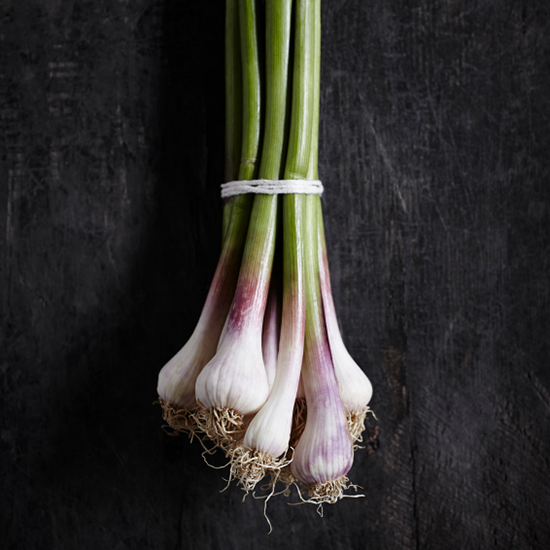 Flavor profile: The flavor of green garlic lies somewhere between a green onion and mature garlic. It is fresh and zingy, with a grassy sweetness and some earthy aromatics. Health benefits: Green garlic contains the same nutrients as full-grown garlic, such as allicin (a sulfur compound and natural antibiotic), manganese (a mineral linked to good cholesterol) and iron. How to eat it: The entirety of green garlic is edible—save for the roots. It can be eaten raw in salads or sliced for sandwiches. Or it can be sautéed, stir-fried or simmered in a soup. For a springy side dish, add lightly browned spring garlic to fragrant jasmine rice, or use it in a creamy sauce for roasted baby potatoes. The bright flavor of spring garlic is also incredible on plump, buttery grilled oysters.